We were delighted to be able to share with you Mr Benn’s very first adventure Red Knight. It was a magical insight into how the face of The Insurance Emporium began his adventures all those years ago. Red Knight saw Mr Benn venture into the magical world provided by the Shopkeeper’s costume shop for the very first time. Transported to a medieval land, he meets a dragon and helps to scupper the plans of a scheming matchmaker. This classic episode displays everything that we love about Mr Benn – magic, mystery and morality! And his adventures didn’t stop there, there was a whole universe to explore. The world of Mr Benn is fascinating and timeless, so we wanted to take this opportunity to share another one of his original adventures with you! 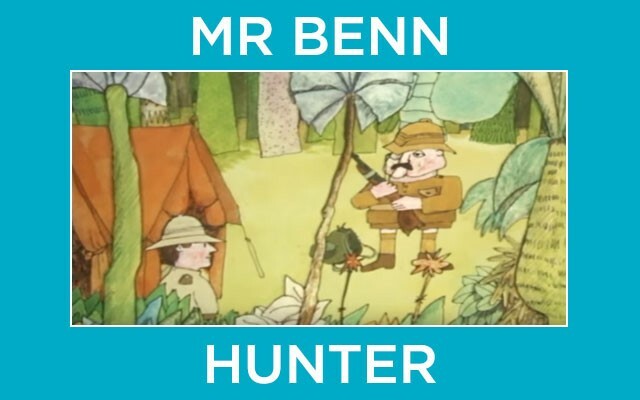 In Hunter, Mr Benn is faced with the tricky dilemma of convincing a big game hunter not to shoot the animals he encounters. We felt that, even though this episode is over 40-years-old, it is even more pertinent in the modern world. At The Insurance Emporium, we are proud to promote our Be Green Like Mr Benn manifesto, encouraging environmental responsibility. Part of caring for the planet is protecting all of the creatures, so we felt that Mr Benn’s message in Hunter was especially important. So what happens in the Hunter episode? Mr Benn wakes up one morning and decides to take a walk. On the way, he comes across plenty of animals and it gives him an idea for an adventure. Visiting his favourite fancy dress shop, he explains his idea to the Shopkeeper. The Shopkeeper immediately knows what to do and gives Mr Benn a pith helmet, whereupon he is magically transported to a jungle. In the jungle, he meets a big game hunter who is determined to shoot every animal he comes across, from birds to a crocodile and many more. Mr Benn manages to convince the hunter not to shoot the animals, telling him he should aim for something bigger, so when they meet a herd of elephants the hunter is determined to shoot them. Fortunately, Mr Benn is able to intervene, advising the elephants to jump when the hunter is about to shoot, causing him to fall over. Failing to shoot his prey, the hunter is then advised by Mr Benn to take up photography instead – which he does so happily! The Hunter episode of Mr Benn first aired on the BBC on Friday 4th March 1971. In the jungle, Mr Benn and the hunter come across a bird, a snake, a deer, some fish, a crocodile, a lion, a giraffe, a hippo and some elephants! Before he visits the costume shop, Mr Benn sits in the park where he spots some pets that look remarkably like their owners. The Hunter episode was repeated twice a year from the date of the original broadcast, for 21 years! The Mr Benn series was voted the sixth most popular kid’s TV series in the 100 Greatest Kid’s TV shows poll, run by Channel 4 in 2001. The best thing about Mr Benn is that the adventures never end, and each one is packed with magic and mystery. To have a look at these, just stop by The Insurance Emporium Youtube page and, as if by magic, you’ll find them there!